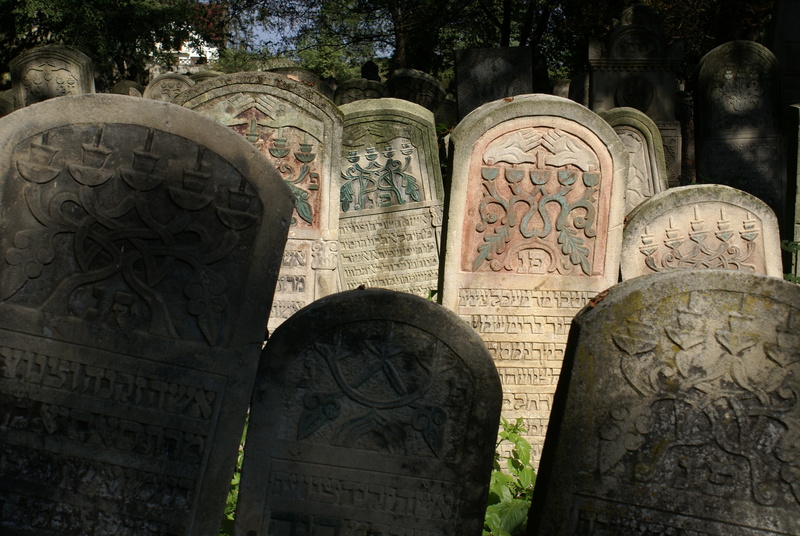 The basis of this project is the collection of photographs of candlesticks on Jewish tombstones that I myself have taken, in Romania, Ukraine, Poland and elsewhere. These images show a vast range of artistry, skill and invention in the portrayal of the candlestick motif in denoting Jewish women. But they are by no means exhaustive. And, in fact, the more I read and the more I work here at the Hadassah Brandeis Institute thinking and theorizing, the more I simply want to be back in the field, seeking out the stones and documenting the iconography, particularly forms that I failed to photographs on earlier trips. 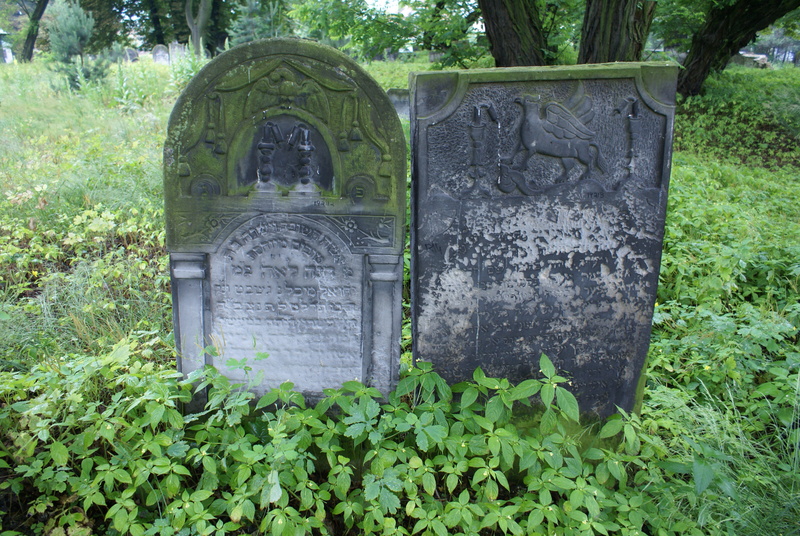 There is, actually, not very much published material on East European tombstone decoration, and even less about the candles/candlestick/menorah motif used to denote women’s tombs. Scholars have begun to bemoan this. There is, wrote University of Massachusetts professor Aviva Ben Ur, “an academic print culture that regards sculpted stones and cemeteries as largely peripheral […] The historian’s focus on the written word has also meant that stone imagery is at most a secondary consideration. 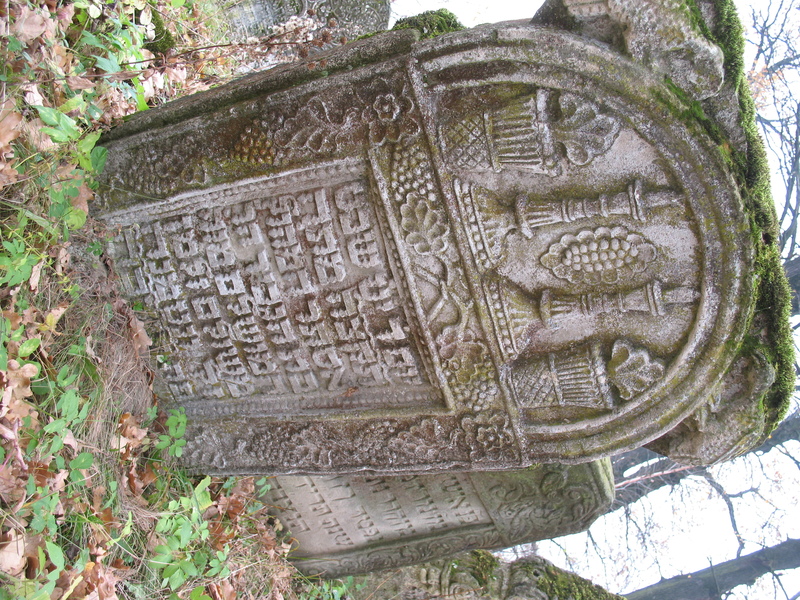 Research on Jewish sepulchres has thus focused on inscriptions, and has been primarily concerned with local community history, genealogy of distinguished members, and linguistic aspects.” (See her article “Still Life: Sephardi, Ashkenazi, and West African Art and Form in Suriname’s Jewish Cemeteries” in American Jewish History, vol 92/1). Boris delves in depth into the meaning of animal and other imagery such as that of birds representing the soul, or heraldic eagles — with one or two heads — representing the absoluteness of heavenly power, or that of a bear holding or pushing through branches, found both men’s and women’s tombs, and believed to symbolize that the deceased was pious or righteous. But he only mentions candlesticks as women’s markers in passing (if at all) — though the photographs that go with his text clearly show a variety of candlestick, candelabra and menorah motifs, including an 18th century tombstone with hands blessing the candles. My friend Monika Krajewska’s ground-breaking book A Tribe of Stone, which came out in Poland in 1993, remains one of the most comprehensive discussions of tombstone art in Eastern Europe — though it deals almost exclusively with Poland. Monika and her husband Staszek were early pioneers in seeking out and documenting Jewish cemeteries in Poland; Monika’s earlier book, A Time of Stones, came out in the early 1980s and was one of the first books on a Jewish topic to be published following the loosening of censorship in Poland thanks to the Solidarnosc revolution of 1980. Piotrkow Trybunalski, Poland, 2010. Broken candles and a griffin. Gura Humorului, September 2009. Griffins and candlesticks. An extremely elaborate, elegantly carved stone, from 1863, including griffins and floral designs. My Aunt, Pearl Gruber Kaplan, passed away Friday in Santa Barbara, California, at the age of 94. She was my father’s oldest sister; the oldest of my immigrant grandparents’ seven children; a military veteran; a mother; a grandmother and great-grandmother; a highly independent woman who lived her life on her own terms. May her soul be bound up in the bond of life. Later, my cousin took a photograph of Aunt Pearl, with the candlesticks and the still life she had painted of them. 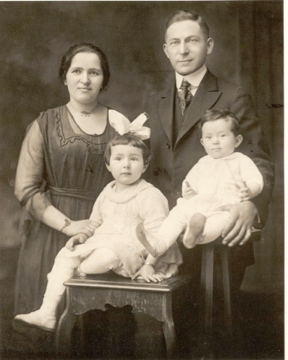 My grandparents Frank and Rebecca, who emigrated from Radauti, with my Aunt Pearl and Uncle Art, c. 1920. Art passed away in 2010. As part of this project, I am examining — in an anecdotal way, to be sure — what I call the transmission of tradition. 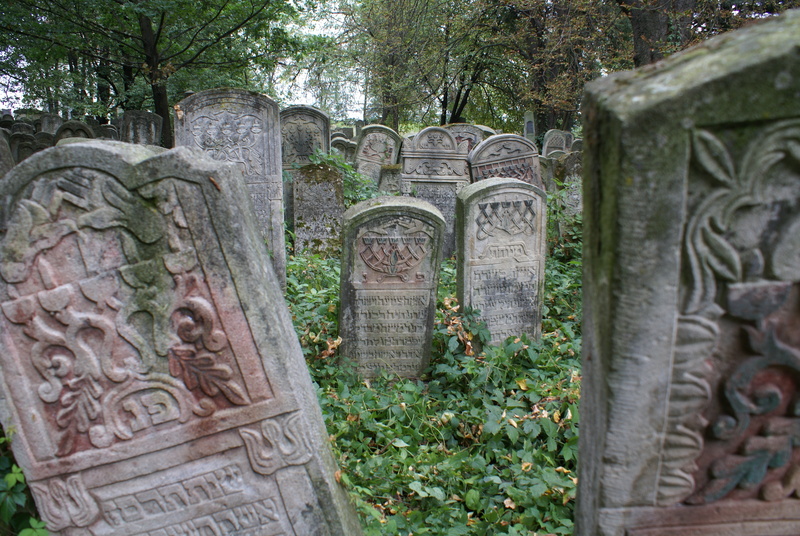 Specifically, I am looking at what happened between the generations of my (probably fairly religiously observant) women ancestors buried in the Jewish cemetery in Radauti, Romania and the generations, in the U.S., who came after. 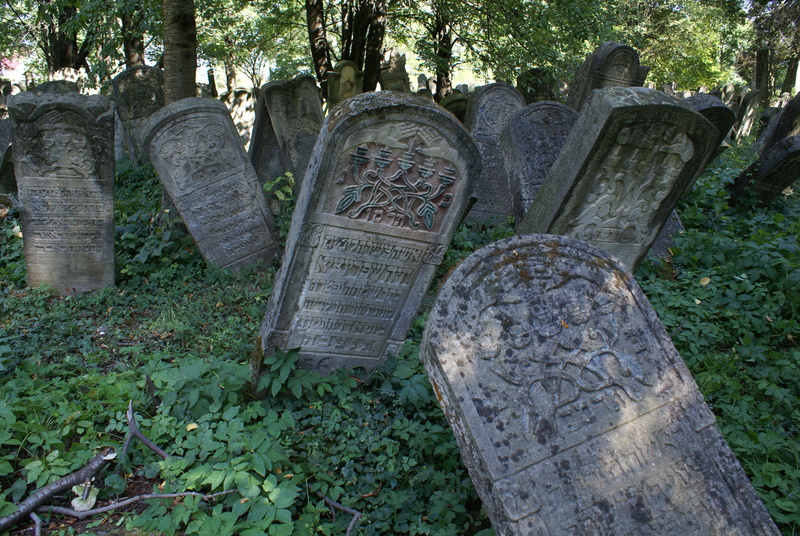 The tombstones of my great- and great-great-grandmothers in the Radauti Jewish cemetery are marked by candlesticks. 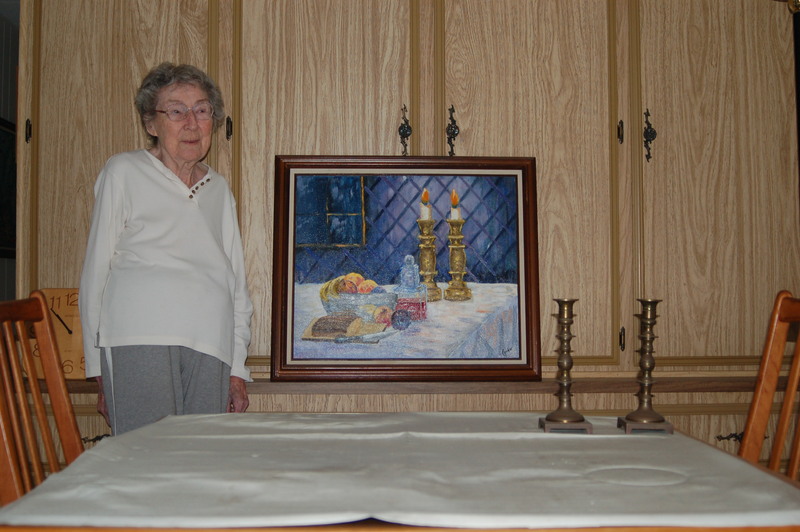 These two women probably fulfilled the women’s commandment to light the Shabbos candles — and maybe the other two commandments, too. But what about us today, their descendants? I myself am not observant, and most of my cousins married non-Jews. I have already recorded on this blog responses from some of my aunts and cousins, including my aunt Pearl, now 94 and, sadly, the recent victim of a stroke, and my cousin Nancy, who found a new direction in tradition through her involvement in the Seattle Women’s Torah project. I’ve asked several other cousins about their relationship to Jewish tradition, observance and identity. My cousin Merrick (Nancy’s sister and the daughter of my father’s younger brother Matthew) offered moving and evocative memories of her childhood in a small mill town on the coast of Oregon, where hers was the only Jewish family for many miles around, and a thoughtful meditation on the meaning of ritual and tradition. Yes, Mom lit Sabbath candles when we were growing up. Even though Mom is not especially religious she probably didn’t ever consider not lighting Sabbath candles, but I suspect Mom & Dad had a special appreciation for this weekly ritual because we were so isolated from Jewish…. anything. She didn’t hold her hands over the candles or circle them at all, she stood with head bowed and said the blessing (in English); now she holds her hands over the candles and says the blessing in Hebrew. It was sort of a special honor when we were little to be the child who she held the match out to & got to blow it out. Later, I would like to watch her as she had a certain way she shook the match to extinguish it. Friday dinners were usually a more special menu too, something like a beef roast, rice, salad, & vegetable. The candles would usually burn for some time after we left the table. It was really kind of pretty to go back into the dark kitchen for some reason with the candles burning low. One kind of funny memory involving the Sabbath candles: We were all watching TV in the living room one Friday night when my (then) boyfriend (now husband), Mike, stopped by late and walked through the kitchen into the living room and joined in with us. After a while he remembered and said ever so helpfully, “Oh, Mrs. Gruber, you left the candles burning in the kitchen so I blew them out.” We were all stunned, and then burst out laughing. We had to go in and look at the stubs of candles sitting there in the candlesticks. No bolts of lightning… and the house still stands. I don’t recall if I lit Sabbath candles as a young single woman. I doubt it. But candlesticks were a special wedding gift from Mom & Dad when Mike & I were married. I don’t remember if I lit candles when we were just a couple (which was only a year), but when I had children I did light Sabbath candles. I probably didn’t light them every Friday, but often (I will have to remember to ask my kids if they remember lighting Sabbath candles). I loved lighting the candles… for any number of reasons, but really one of them was the connection I felt to a long, long line of women who did this before me and with me. Whatever Jewish traditions, few as they are, that I practice they have always connected me more to my lineage than to God…. Sabbath candles most of all. As my kids got older and life seemed busier and busier I looked forward to the brief moment of calm and gathering that lighting the Sabbath candles brought. It was refreshing. Somehow as Friday nights became obligated with the kids high school activities, Sabbath candles just didn’t get lit more and more often and then not at all. I haven’t lit Sabbath candles for years. Tradition? I grew up as a member of the only Jewish family in a rural Oregon town. I admire how much tradition Mom & Dad (and grandparents and family), were able to pass on to us in that situation, but there are big gaps. I’m aware of that. But I still live in Toledo so I don’t have a very good gauge to know what Jewish tradition can really look like if you have a Jewish community. Right now, I don’t have a lot of Jewish tradition that I practice, but like I said earlier, that will be changing… at least a bit. 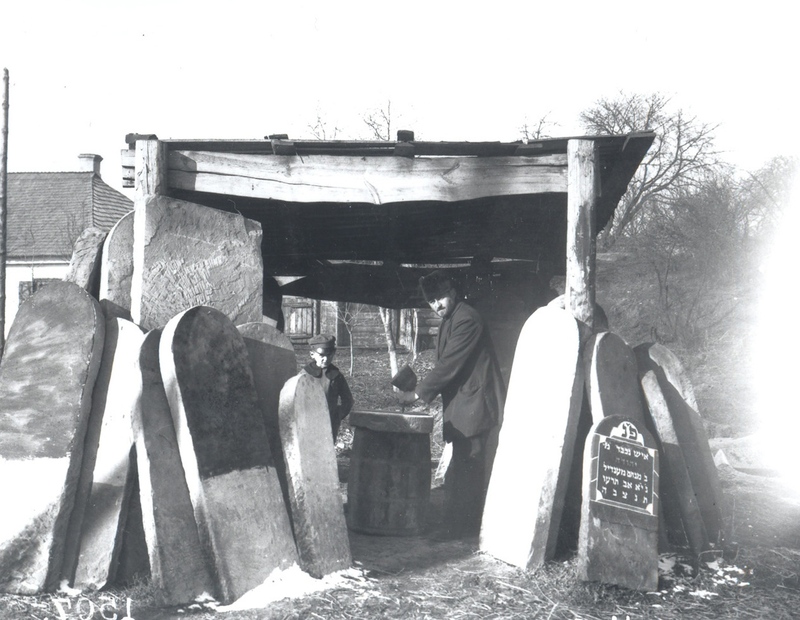 I’m posting this wonderful picture that Sergey Kravstov sent me of a tombstone carver in his shop in the town of Volodymyr-Volyn’skyi, Ukraine (known in Yiddish as Ludmir), in the Autumn of 1916 (the date is known from the date on the tombstone in the picture, which is assumed to have been carved — and painted — within the month after the funeral). The photo is from a glass negative held in the Bildarchiv (picture archive) of the National Library in Vienna. The town is just inside today’s Ukraine near the Polish border, between Zamosc in Poland and Lutsk, Ukraine. At the time the picture was taken, about 6,000 Jews lived in the town. Sharhorod, Ukraine -- sketched candlesticks and painted color. When did candlesticks become standard shorthand for denoting a woman? Using candlesticks and candelabra to denote women on tombstones was very common by the mid to late 19th century in the parts of Eastern Europe where I have been focusing this study (northern Romania/Ukraine/Poland and surrounding territory). Indeed, by the late 19th century and early 20th century this imagery was utilized almost across the board (though birds and flowers were also used) — and it still is the most common motif on women’s gravestones. 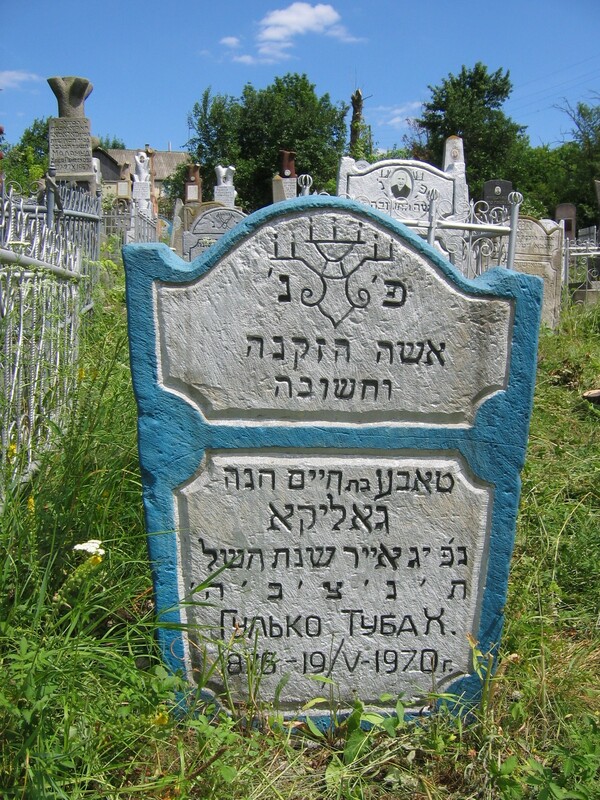 By the late 19th century there was even a variety of set designs or even pre-fab stencils or templates, including designs of fanciful candlesticks, such as the style that marked the grave of of my great-great-grandmother, Chaya Dwoira, in the Jewish cemetery in Radauti. These designs are striking and intricate but not great examples of artistic stone-carving — though they derived from the wonderfully sculpted and imaginative stones of the 18th and early 19th centuries (and even in the 17th century). But, when massed together in a crowd, as in Radauti, they are very impressive nonetheless, providing a sense of — well — community or communality, in a way: a chorus. 100 years and more ago they would have presented even a more striking sight, as they would have been painted bright colors – traces of red, blue and green paint are still visible on some stones. Some of these “off the shelf” designs are rooted in the earlier designs of braided candelabra branches and bases that formed the mystical “endless knot” motif. Others attach leaves or sprouts to candelabras, referring, I imagine, to the also mystical “candelabra/menorah as tree of life” motif. Some show hands blessing the flames; others do not. What is interesting, too, is that even stones that looks as if they were carved from identical stencils often differ in subtle ways — note, for example, how the hands are carved differently, and how there are other slight differences in the ornamentation. When did the candlesticks imagery become the norm? In the Old Jewish Cemetery in Siret, Romania, some of the women’s tombs dating to the very early 19th century bear candle imagery (one has the representation of an antique-looking menorah, others with more fanciful candelabra, in combination with plant motifs). And some candelabra or candle-bearing stones in Ukraine date back as early as the mid-18th century. 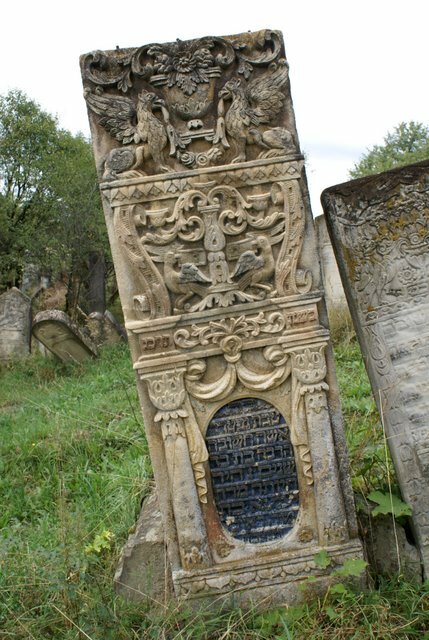 These were documented by the researchers Benjamin Lukin and Boris Khaimovich from the Center for Jewish Art, who did his PhD on 17th and 18th century Jewish tombstones in Ukraine. 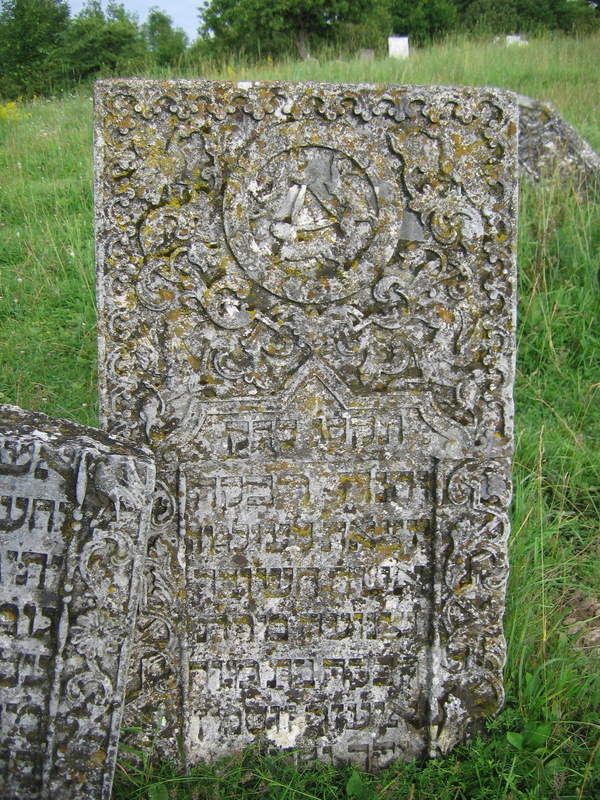 They report (in the book Grandeur and Glory: Remnants of Jewish Art in Galicia, p 123) that the stone of Esther daughter of Yitzchak, which dates from 1781, is one of the oldest stones in the Jewish cemetery in Kosuv, Ukraine. It shows hands blessing the flames on a seven-branched Menorah and may be one of the earliest stones to bear this image of blessing hands. Otherwise, the older stones do not seem necessarily to use a specific visual signifier for woman. 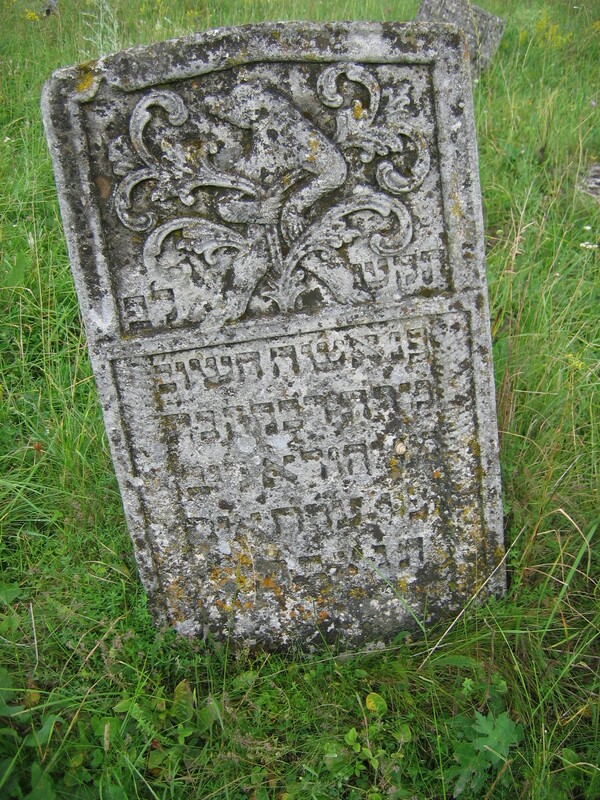 In the cemetery at Sataniv, for example, the tombstone of Rivkah bat Eliezar Susman, from 1803, bears the mysterious “three hares” carving — three hares joined at the ears an in optical illustion — in a floral medallion flanked by birds and griffons.